We see chandeliers at the flea market all the time, but the really old ones are too expensive and the cheap ones are boring and don’t look old enough! What to do? Buy a $10 brass fixture, age it with spray paint, and give it a Victorian makeover, Steampunk style! It’s a Steampunk Clockface Chandelier! 1. To prepare the chandelier for aging, start by cleaning the surface and removing the clear coating with cotton balls and acetone nail polish remover. Next, rough up the surface with sandpaper. Wipe with paper towel to remove any dust. 2. Rather than repaint the whole chandelier, create an aged finish by dusting the fixture with sweeps of the Krylon® Fusion Textured Shimmer Graphite spray paint. Use a light hand so the sanded brass finish will show through. To create the look of tarnish and pitting, spray the chandelier in spots with short bursts of Krylon® Outdoor Spaces® Hammered Finish in Brown Metallic. Let dry. 3. To add the dangles to the top of the chandelier, punch five holes around the top bobeche with the metal hole punch pliers. Attach one skeleton key to a length of 22-ga. brass wire using round-nose pliers to form a wrapped loop. String and wire work assorted beads and chandelier crystals onto the wire until the dangle is about 4 in. long. Extend the wire up through a punched hole in the top bobeche. Feed a bead onto the wire and pull the wire tight to anchor the dangle. Wrap the end of the wire around the bead to secure. 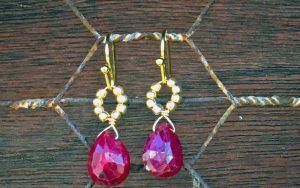 Repeat until you have five dangles embellishing the top bobeche. 4. To make the clock face dangles, start by punching a hole in the top and bottom of each clock face using the screw-style two-hole metal punch. 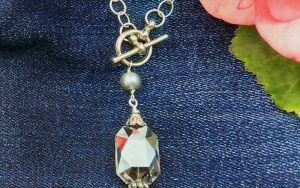 Add a mini padlock to the end of a length of 22-ga. wire, string or wire work assorted beads and chandelier crystals onto the wire, then attach to the bottom of a clock face with a wrapped loop. 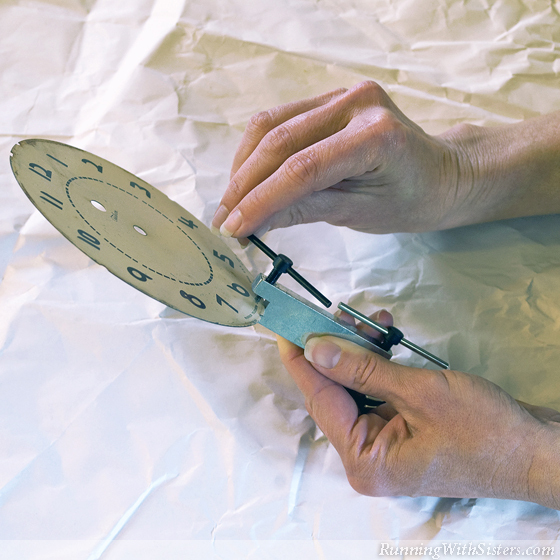 Attach a second length of wire to the top hole in each clock face and secure with a wrapped loop. String or wire work assorted beads and chandelier crystals onto the dangle. After the last bead, wrap the wire around the mandrel to create a loop to fit over the chandelier arm. 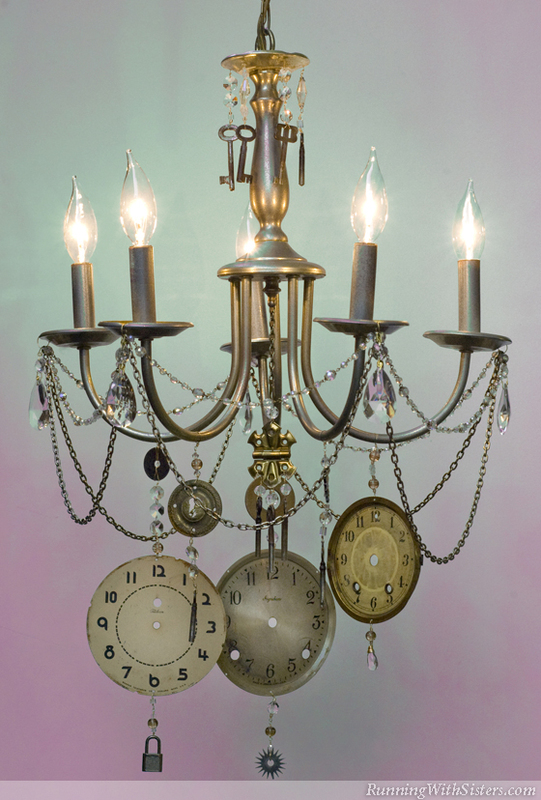 Hang the clock dangle on one of the chandelier arms and secure with wire wrapping. Make two more clock dangles finishing each with a different pendant, such as a gear or a crystal, and hang from two of the arms. Use the same technique to add two dangles featuring skeleton keys instead of clock faces to the remaining arms. 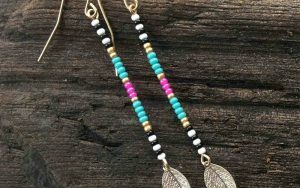 Our dangles range in length from 6 inches to 12 inches. 5. To make the hinge tassel, spread open the hinge. Wire work a key to each hole in one side of the hinge using bead-and-wrapped-loop components. Cut a 3½ -in. length of cuckoo clock chain using the heavy-duty wire cutters. 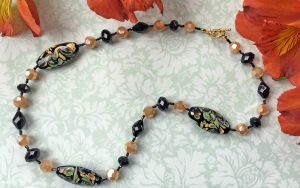 Attach the other side of the hinge to the end of the chain using a bead-and-wrapped-loop component. Wire the top of the chain to the center finial with the 22-ga. brass wire so the tassel hangs down from the center of the chandelier. 6. To drape the chandelier with beads, punch a hole in the outside edge of each lamp bobeche using the metal hole punch pliers. 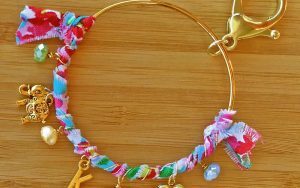 Make five large jump rings using the 20-ga. wire and the mandrel. Attach a jump ring to each bobeche. String the crystal necklace around the chandelier, hanging it in shallow swags from each jump ring. Attach a 92-in. length of chain to the jump rings creating deeper swags around the chandelier. Slide a replacement chandelier crystal onto each jump ring. Close the jump rings with the chain-nose pliers. 7. Instead of installing as a normal light fixture, convert the chandelier into a swag lamp. Attach the wires of your fixture to the grounded plug using a Phillips screwdriver. Then hang the chandelier chain from a swag hook in any room in the house. Econo-tip: Old skeleton keys can be hard to find, but we made a great discovery. Old furniture keys, the kind used to lock sideboards and armoires, look just like skeleton keys. And best of all, they are easy to find and inexpensive. We paid a dollar each for ours! Time Saver: If you don’t find a cigar box full of old clock faces at the flea market, look for broken clocks to take apart. You might also try calling your local clock repair shop and asking if they have any throwaways. That is so cool., it almost makes me want to change my decore to accommodate it! This is just what I have been looking for!!! My husband is not interested in a redo on our dinning room light which is very close to the one used here. With a bit of a push I think I will be able to get him to take a look at making our own statement by doing a version of this supper idea. Looking forward to see/do ideas! I love the whimsy of steampunk. Trouble is…my house is far too traditional. In the meantime, keep up the clever ideas…they are appreciated.